It&apos;s no secret that Chinatown is in the midst of change. Now it seems that, maybe, Hop Louie will be the latest establishment to make its way out. We first heard about it from Ronald Gibson‎ on Facebook. In the "Photos of Los Angeles" group he posted a picture of the Hop Louie sign, along with a caption that read, "Hop Louie in Chinatown is closing at the end of August." In the comments section he said that he&apos;d heard about it from "someone that has been going there for years." Another commenter added, "I&apos;m at Hop Louie right now. The bar remains open for the foreseeable future and is ready for business while the restaurant upstairs takes a break. I think this might have something to do with the end of summer tourism." We called Hop Louie to get a confirmation. A man—he&apos;d refused to provide his name— told us that, "there will be no more restaurant next month," but did not elaborate more on the matter. When asked if there&apos;ll be a party to celebrate Hop Louie&apos;s decades-long run, he simply said no. He also indicated that only the restaurant is closing, corroborating the Facebook claim that the bar will remain open. If the suspicions are true, and Hop Louie is indeed closing, you will be hard pressed to find people who are surprised by the news. Decidedly hipper spots like Howlin&apos; Rays and Pok Pok have moved into the neighborhood. There&apos;s also the fact that, for the past two decades, the San Gabriel Valley has been regarded as the true destination for diners looking for exceptional Chinese cuisine. Chinatown fare, then, has been regarded as being strictly for tourists, neighborhood locals and late-night revelers from one of the nearby bars. It&apos;d be unfair, however, to say that Hop Louie didn&apos;t have its own allure. The $5.50 lunch special is a real bargain, and the crab rangoon has been vetted on Yelp and LA Weekly. Also, the restaurant looks like something out of a movie set and, for better or for worse, has become an attraction in and of itself. It has been featured in films like Lethal Weapon 4, I Love You, Man and Mystery Men. Opened in 1941, the restaurant sits beneath a five-tier pagoda that&apos;s ringed with neon green. "Hop Louie" is spelled in a faux-Oriental script on the store-front signage. The interiors are just as ostentatious; paper lanterns hang from the ceiling, and the chairs looked as if they were stage props. So, yes, Hop Louie is big on kitsch. And the menu may not be as authentic (the crab rangoon is a tell-tale sign). But, still, the restaurant is symbolic of a time when you couldn&apos;t just dish out dongpo pork or lion fish and expect it to pull in a profit. Hop Louie, and many of the old standbys in Chinatown, attest to the entrepreneurship of immigrant chefs and business owners. They&apos;d come to American on the heels of opportunity, and as smart businessmen they aimed to broaden the appeal of their establishment. Some might regard this as cultural pandering, but you could also see it as a corollary of smart marketing. As for the bar, tucked away on the first level of the restaurant, we&apos;re hoping it&apos;ll indeed be allowed to go on. Dark, bleary, and reeking of cigarette smoke, the watering hole is among the last bastions of dive bars in the city. While the barkeep is gruff, the drinks come fast, cheap, and stiff. We&apos;ll provide updates when we hear more news about Hop Louie. 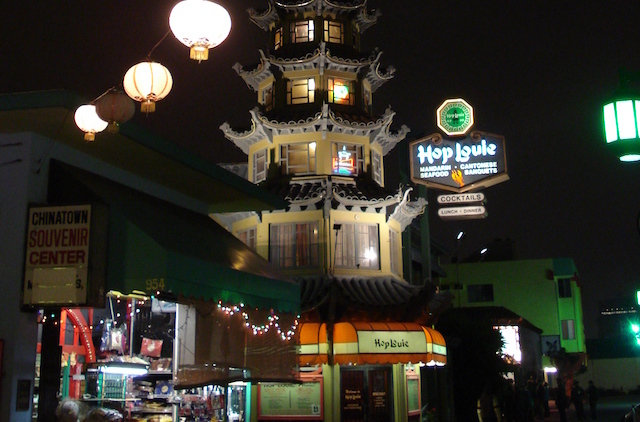 Hop Louie is located at 950 Mei Ling Way in Chinatown&apos;s Central Plaza, (213) 628-4244.